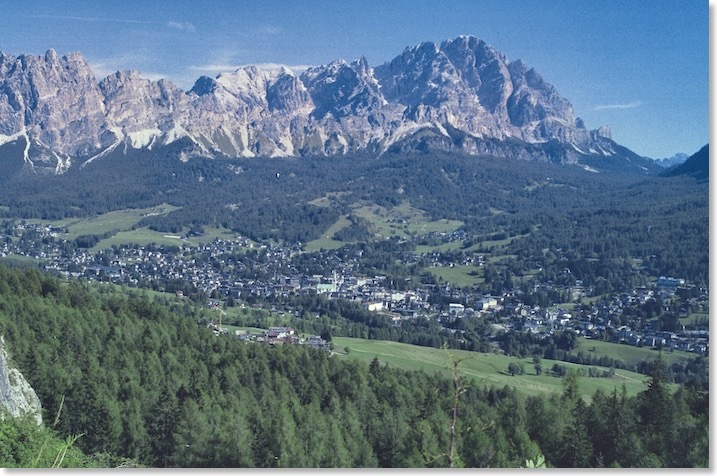 And so we reach Cortina. 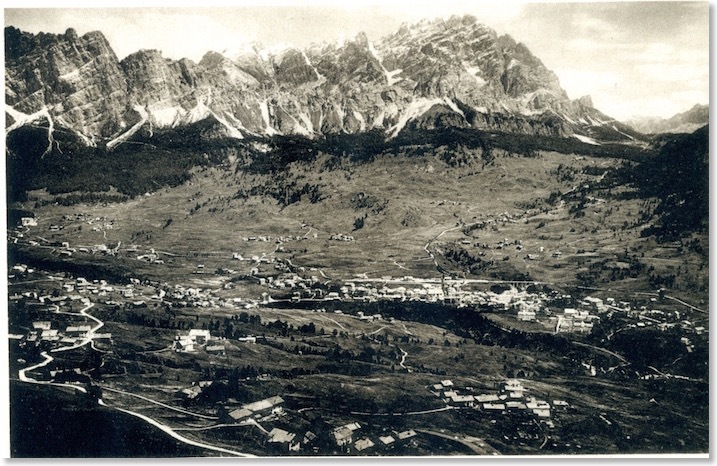 My photo above is essentially the same view today of the town which Zardini photographed (and worked from) and the comparison vividly illustrates how Cortina has expanded. Nonetheless, its white church spire remains prominent (just below dead centre of both photos), possibly more so now than ever. Close inspection under a lens also reveals that the viaduct into the town centre of the former north-south narrow gauge railway can also be made out. 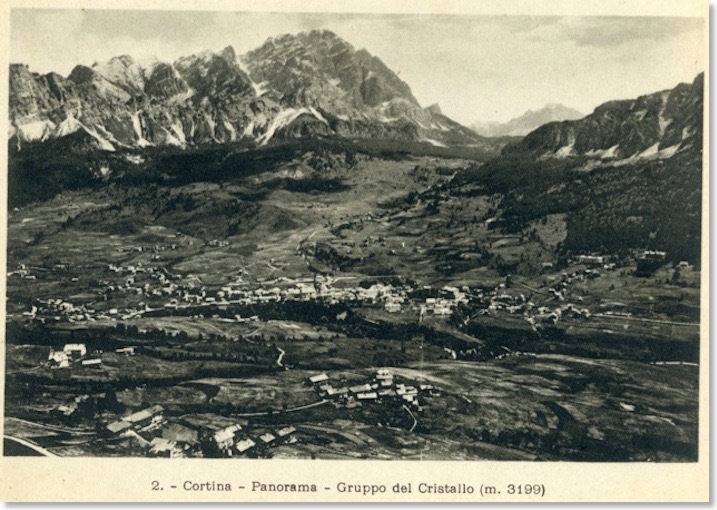 Building development and large, managed pine forests on the slopes of the Passo Tre Croci (right-hand side of the photograph) and in the foreground obscure much else, however. 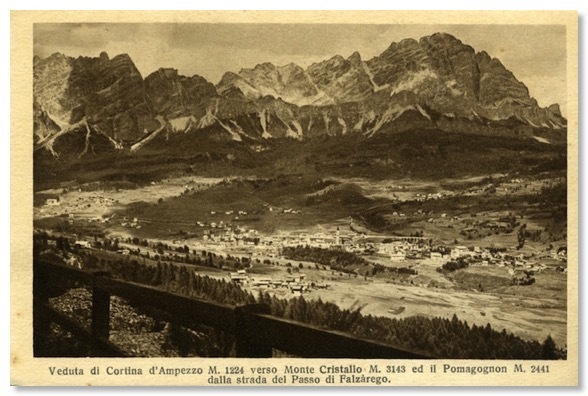 At first glance, except for the framing, this might look to be the same photo to the one at the top of this page, from the Bolzano - Cortina booklet. But look more closely at a few parts of the town, and it has grown a little. That suggests the shot may specifically have been re-photographed for the booklet. As a Cortina-based photographer, Zardini will have had many opportunities to photograph the town as it grew. The further growth of the town in several places is very clear from this crisp shot. 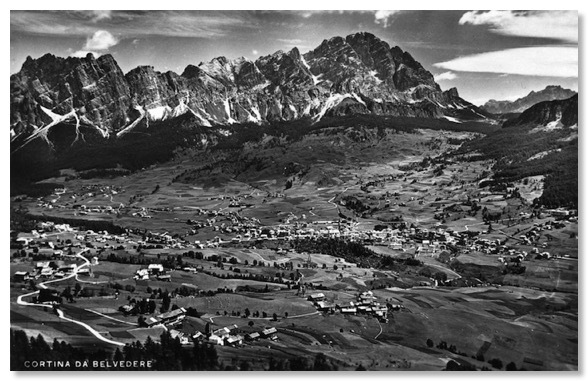 The caption reveals the view point to have been “Belvedere”, which is a spot at 1,508 metres, to the north-west of Cortina, about 25 minutes walk from the Road. This seems to have been the same viewpoint for all three photos. Mine was from The Road itself, beside the Crepa Tunnel, and a re-visit at some stage will explore whether the original viewpoint is still there. This seems likely from the map. My Italian flea-market browsing unearthed this card, which carries no date or postmark, sadly. Studying the local buildings under a strong magnifying glass suggests it may not have been taken all that many years after Zardini”s shot at the top of this page, and might even be earlier. Again, the church tower and the railway viaduct are very easily seen. The fencing suggests the viewpoint if from the Road itself, close to where I took my own photo above. Nowadays, Cortina has reached the incongruous position of having a number of large hotel buildings standing empty or in need of modernisation, while significant new building work on fresh sites still goes ahead. Such are the insane economics of the ski industry.